1 weeks from 12th June 1965. Detail : The Beatles eighth official E.P. 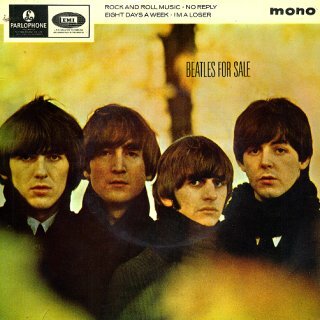 Four songs from the Beatles album "Beatles For Sale" were packaged with a copy of the L.P. cover design. 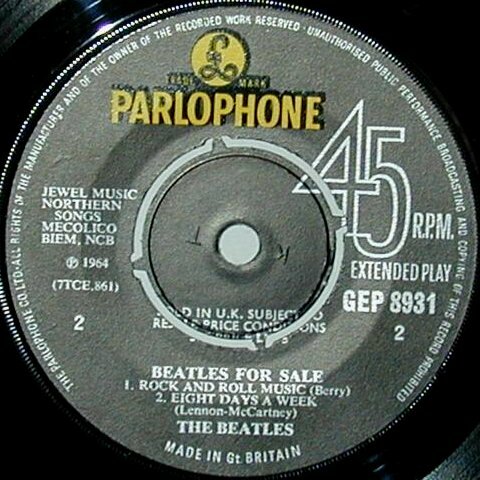 Three of the tracks had been considered as their last single of 1964, until John came up with "I Feel Fine". The track NOT thought of as a single was their stage favourite "Rock And Roll Music", this was because it was not written by the lads, and cover versions would no longer be considered for their own single releases. 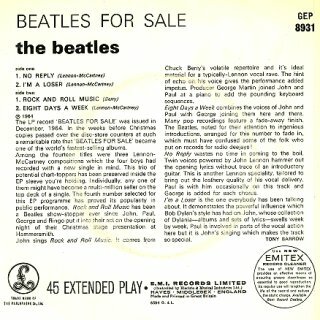 The sale for the album "Beatles For Sale" had been so remarkable, that fewer buyers were interested in this E.P. or its successor. The E.P. was released in a picture sleeve, and had sleeve notes by Tony Barrow. The typeface on more recent issues is both more modern and smaller than on the originals, while the actual catalogue number was actually BIGGER on originals. 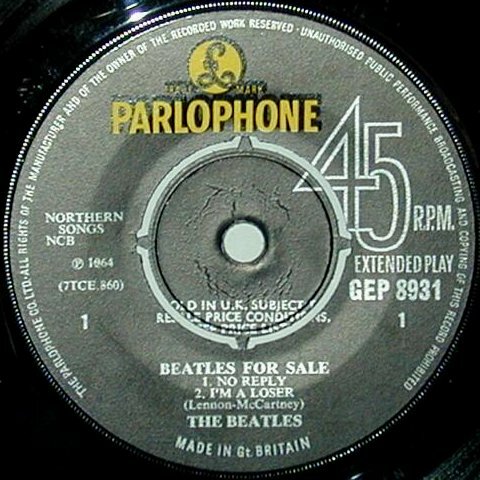 Around the edge of the label, the words stating the rights of the publishers started with "The Parlophone Co. Ltd." and across the press-out centre the words, "sold in U.K. subject to resale price conditions, see price lists" are present. The embossed "KT" tax code is visible on the side 2 record label. Post 1965 re-pressings have the rights starting with "The Gramophone Co. Ltd.". Re-pressings were also made in the 1970's, these do NOT have "Sold in the U.K. ...". The sleeve also has marked differences. For starters (surprisingly !) the quality of new editions is worse, which suggests that EMI copied old sleeves rather than the actual photos ! ... I could demonstrate this with my copy of "A Hard Days Night", I have an original and a newer edition, and it is astonishing how much worse the newer one is ! Next, look out for the edges of the fold of the front cover onto the back. The edges of the fold used to be curved, now they are sharp, straight. Finally, the fold itself is no longer laminated, and the cover itself feels thinner than before. ©2000 Graham Calkin's Beatles Pages. All Rights Reserved.